This is a recipe that is a little different, it is something new to bring to your holiday table, or maybe a Christmas party. It requires a little work, but it is so, so worth it. It starts out with a rosemary shortbread crust. The rosemary compliments the cranberry curd so nicely. This is pretty simple, it all comes together in a food processor, freeze and then bake. The beginning of the curd. Cranberries have such a gorgeous color. You can do these steps in advance too. The longer you let the crust sit, you will have a stronger rosemary flavor. A note about this recipe: the original recipe had photos with very bright curd, and mine turned out to be more of light pink. I thought I totally failed while making this, but it still tasted amazing. So, don't be concerned if your color doesn't exactly match. It will still taste great. I think it has a lot to do with the cranberries used, after reading comments on the original recipe a lot people had the same results. I topped mine with sugared cranberries for a little something extra. I used this method, you can do this the same day or the day before. This is optional, but it makes the tart look so pretty. In a food processor, pulse the butter and sugar until combined. Add the egg yolk and pulse until combined. Now add the flour, salt and rosemary pulsing until the mixture is crumbly and thoroughly mixed. Evenly press the dough into a 10-inch tart pan. Freeze for 20 minutes, meanwhile preheat the oven to 375 degrees F.
Bake, rotating half way through, for 20-22 minutes or until golden. Let cool completely on a wire rack. In a saucepan over medium heat add the cranberries, sugar, orange juice and zest. Simmer for about 10 minutes, until the cranberries have popped and softened. 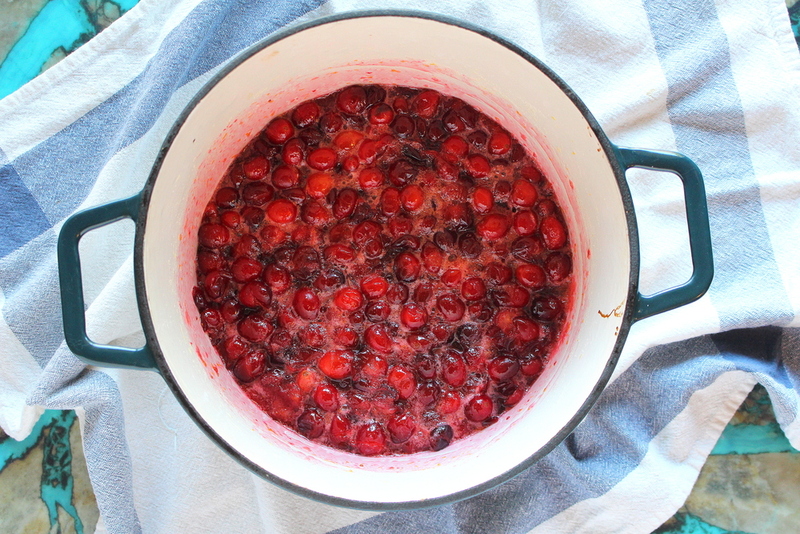 Press the cranberry mixture through a mesh sieve and into a large bowl. Whisk the butter into the mixture until smooth. Wipe out the pot and set aside. Put the eggs and egg yolks into a small bowl and beat lightly. We are going to temper the eggs with the warm cranberry mixture. Slowly whisk a cup of the cranberry mixture into the eggs, then add the egg mixture to the remaining cranberry mixture. Whisk until smooth. In the same pot we just wiped out over low heat, cook the cranberry mixture until nearly bubbling and thickened. Let the curd cool to room temperature. If working ahead, cover with plastic wrap (pressing the plastic against the curd) and refrigerate. The curd can be cooked up to one day ahead. Pour the cooled curd into the cooled tart shell, and smooth the top with a spatula. Bake for 10-15 minutes to set the curd (set your timer for 10 minutes and check the curd). Cool on a rack before slicing. 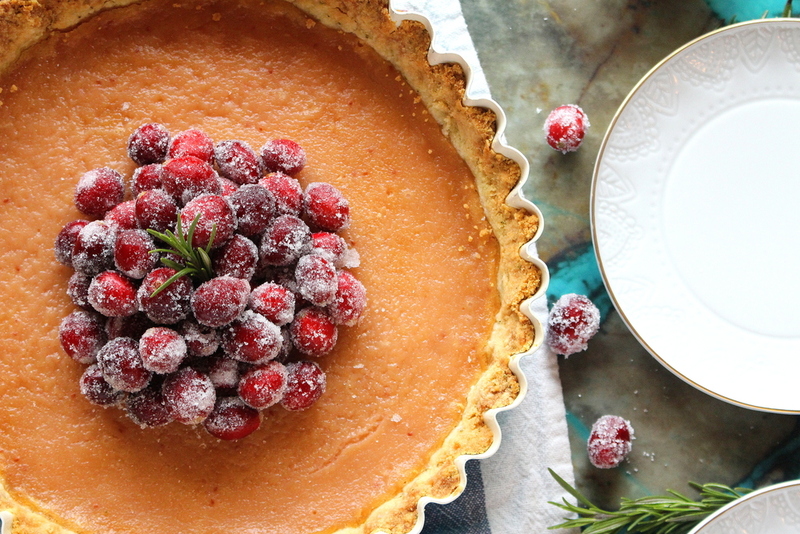 Garnish with sugared cranberries, rosemary and enjoy!